Gerald M. “Jerry” Juzek was born on January 6, 1920, in Sioux City, Iowa. He attended Central High School in Sioux City and was a football and baseball star at the University of Mississippi. As a freshman football player he outshone such teammates as Charley Conerly, who went on to play in the NFL, and Doug Kenna who later gained All-America recognition at West Point. But Juzek entered military service in 1942, his sophomore year at Ol’ Miss, and served with the Marines. Following boot camp at San Diego, California, Sergeant Juzek served with the Third Marine Regiment, and was among the first wave of Marines to hit the beach at Guadalcanal in August 1942. Juzek noticed that a machine gun at an advanced outpost had apparently jammed and he decided to help out. He wriggled forward on his belly and just before he reached the gun a Japanese mortar shell exploded. All four members of the gun crew were killed instantly. Juzek returned to the United States on a hospital ship and docked at San Pedro, California, from where he was taken to Long Beach Naval Hospital. Recovery was slow but miraculous “thanks to the finest doctors in the world and the tender care of nurses,” he told The Sporting News. 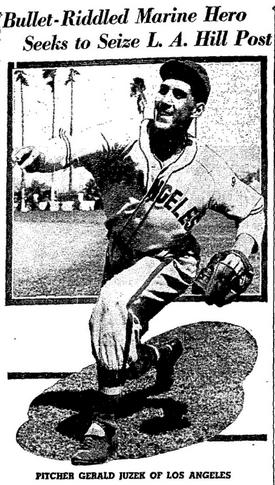 Juzek never gave up on his dream to play baseball again, and on April 1, 1944, less than two years after his devastating injuries, Juzek pitched the last three innings of a 7-1 loss for the Pacific Coast League’s Los Angeles Angels in an exhibition game against the Port Hueneme Seabees. He allowed only one hit and proved that he could pitch at the professional level. He went on to pitch six games for the Class B Piedmont League's Portsmouth Cubs, to begin an eight-year minor league career. Juzek joined the Hollywood Stars on March 16, 1945, but was optioned to the Memphis Chicks of Southern Association in May. In June he was traded to the New Orleans Pelicans. He was released by New Orleans in late July but picked up by the Nashville Volunteers in the same league. On August 30, 1945, wearing uniform number 30 and pitching for Nashville, Juzek blanked the Little Rock Travelers on one hit for seven innings, enjoying a 9 to 0 lead. Just before taking the mound for the eighth inning, however, Juzek, changed to number 15 and was promptly hit by a five-run attack. In 1946, he was with the Macon Peaches and the West Palm Beach Indians, and played for the Ozark Eagles in the Alabama State League in 1947, where he was 8-10. Juzek was with the Donalsonville semi-pro team in 1948, and was signed by the Atlanta Crackers of the Southern Association in late August 1948, making nine appearances for an 0-1 record. In 1949, he played with the Riverside Dons in the Class C Sunset League. This team became the Rubidoux Rubes in July, and by September, he was with the Porterville Packers in the same league, remaining with that team through 1950. Juzek was 5-10 with the Visalia Cubs in the Class C California League in 1951, and 1-5 with the Tucson Cowboys in the Arizona-Texas League in 1952, aged 32, to end his playing career. Jerry Juzek, who was married to Elsie, went on to conduct baseball clinics near his home in Porterville, California, and operated the Fireside Inn restaurant in Porterville, for many years. Ballplayer, wounded veteran and recipient of the Purple Heart, Juzek passed away in Porterfield, on January 10, 2006, aged 86.